By realizing a number of social projects to support the integration and rehabilitation of physically impaired people in the country, Azercell Telecom introduces its next well-intentioned and innovative initiative in this regard. Thus, the Company has introduced an extra out-of-order button for people with special needs in Q-matic devices at Customer Service Centers. 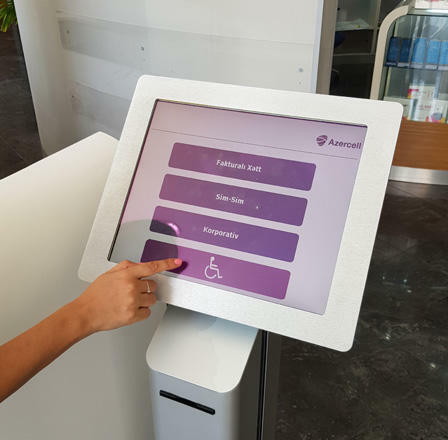 Now, all visitors with physical disabilities may benefit from this opportunity at customer service points located at 2 B. Baghirova Street and 26A Taghiyev Street. It is worth noting that this initiative has been active at the customer office at 2 B. Baghirova Street since April and at customer services at 26A Taghiyev since June this year. So far, more than 100 subscribers with physical disabilities have benefited from this novelty for services access. The Company intends to apply similar initiative in the other Customer Service points by the end of the year. Currently, people with physical disabilities comprise 15 percent of total world population. Nearly 6 thousand people, including 72 thousand children suffer from physical disability in Azerbaijan. Notably, Azercell has provided its contribution to Children’s Paralympic Committee since 2014 with the aim to support the integration of children with various disabilities to the society through rehabilitation. In addition, dozens of disabled citizens are provided free examination and treatment every month by Mobile Eye and Mobile Dental Clinics. Veteran tariff launched by Azercell in 2013 for Great Civil War, Afghanistan and Garabagh War participants allowed 40 thousand subscribers to benefit from discounted communication services. Focusing on the principles of improving the quality of human life through technology in its social responsibility strategy, Azercell Telecom, the leading mobile operator in the country, will continue its initiatives and projects in this regard. The leader of the mobile communication industry, the largest taxpayer and the biggest investor of the non-oil sector of Azerbaijan Azercell Telecom LLC was founded in 1996. With 48% share of Azerbaijan’s mobile telecom market Azercell’s network covers 80% of the territory (excluding 20% of the occupied territories) and 99,8% of population of the country. Currently, 4,5 million subscribers choose Azercell services. Azercell has pioneered an important number of innovations in Azerbaijan, including GSM technology, advance payment system, mobile internet services, Metro coverage, 24/7 call centre service, 7 day/week Front Office service, M2M services, one-stop-shopping approach Azercell Express offices, mobile customer services, Online Customer Care and Social Media Customer Care services, mobile e-signature service “ASAN Imza” etc. Azercell deployed first 4G – LTE services in Azerbaijan in 2012. According to the results of mobile network quality and wireless coverage mapping surveys by international systems, Azercell’s network demonstrated the best results among the mobile operators of Azerbaijan. Azercell is the only company in Azerbaijan and CIS region which has been awarded Gold Certificate of International “Investors in People” Standard.